Beach honeymoon destinations that you just can't miss! Beaches evoke romance - I mean what’s better than sitting amidst the sand, watching the blue sky, cosying up with your beloved and admiring the waves as they come close by? If that’s a scene coming alive in your honeymoon dream, then it’s about time to go live it! Here’s listing the best beach honeymoon destinations which make for the perfect set ups to kick-start your ‘Happily forever’. Scroll through and explore the places virtually before you pick these out for your most-awaited trip! How about beginning your musical beach journey with flying to Kingston, the capital, and hitting the Bob Marley Museum at his former home and the recording studio? You can then visit the white-sand strands which include the Blue Lagoon, Frenchman's Cove and the Long Bay. These are all prime places for taking a swim or going snorkeling! P.S: You can also time your beach honeymoon to catch one of the major music events like - Montego Bay’s Reggae Sumfest in July; a party-till-sunrise weekend of reggae, dance hall and hip-hop. The place offers a top-notch surfing condition, while the inland rainforests - just a short day trip away, is known for it’s Avatar-worthy flora, ample wildlife and active volcanoes. You can book a room in one of the lively beach towns like - Playas del Coco or Tamarindo, both bustling with vibey restaurants, quaint shops and the coolest nightclubs! While Playas del Coco is a prime location for swimming and snorkeling, Tamarindo is the place to hangout! After you would have had your fill of sand and sun, some crazy adventure awaits for you at Rincon de la Vieja National Park, with its jungle-shrouded volcano, misty waterfalls and thermal mud pools, plus activities like white-water rafting, horseback riding and hiking. Situated on the point of coast where the Pacific Ocean meets the Sea of Cortez - Los Cabos offers golden beaches backed by rugged rocks! For all the adventure junkies out there, this terrain also offers hard-core land adventures, such as ATV tours through sand dunes or treks through the Sierra de la Laguna canyons. You can also explore Baja with a beachfront camel ride finished off with handmade Mexican tortillas and a tequila tasting event. In the Serengeti National Park - an open-air Land Cruiser motors you into the house of exotic creatures - hippos, baboons and all of the Big Five — lions, elephants, rhinos, leopards and buffaloes! These plains are also the location where the Great Migration takes place - an endless cycle in which vast herds of zebras and wildebeests chase the rain (January through March). Also, don’t miss a trip to Ngorongoro Crater, a virtual Eden whose natural spring provides unlimited nourishment for nearly 25,000 animals. You can then conclude your journey relaxing on the tropical isle of Zanzibar, a quick 30-minute flight from Dar es Salaam - Tanzania’s capital. Boasting such exotic blend of Africa, Persian, Arabic and Indian cultures, as well turquoise seas and more than 25 beaches, this is an ideal spot for some R&R before the long flight home. Santa Barbara is the quintessential California coast surrounded by vineyards, orchards and family farms. So, it goes without saying that this pretty village is equally famous for food and wine too! You can rent a beach cruiser along the waterfront and cycle it to the eclectic Funk Zone - the home of diverse tasting rooms from modern Municipal Winemakers - iPads loaded with tasting notes are on hand to traditional Carr - barrels stacked along the wall. Also, before calling it a day, pick up a local vintage and Cali-made cheeses and head back to the town for a beachside picnic. Apart from being the country where Lord of the Rings was officially shot, New Zealand is an ideal beach escape in spring and fall when weather is great and crowd is lesser! You can start from the Southern Alps with skiing and trekking through the glacier-carved fjords and then head to Nelson - the other end of the South Island, to get your beach on! This perpetually sunny end features palm trees and long stretches of white sand along with outdoor cafes, wineries and galleries, is perfect for your beach honeymoon. Along the North Island - a two-hour drive from Auckland are rainforests mountains and gorgeous beaches. You can also head to the Hot Water Beaches and dig into the sand at low tides or create your own personal hot tub from the geothermal springs below. Continuous sunshine and captivating historical culture at this picturesque Mediterranean coastline of southern Spain make it a perfect recommendation for all newlywed couples on a honeymoon! The most popular beaches here are in Marbella - where all the luxury resorts, restaurants, beach bars and golf courses coexist within the ancient castles and cathedrals! Visit the famous Granada - where the ninth-century Alhambra Palace rests high above the city and is flanked by fragrant gardens. Also something totally picturesque are the ‘white villages’- hilltop towns such as Ronda; the birthplace of bullfighting and home to the 18th-century Puente Nuevo and Casares; whose sugar-cube-shaped buildings are stacked precariously beneath the ramparts of Arab Castle. You can start your spiritual journey from the artistic hub of Ubud, where people greet the sunrise with guided meditation and then visit the Sacred Monkey Forest Sanctuary that houses some major temples and end the day with taking a hike to the holy spring of Tampaksiring, where the Hindu priests and healers perform some sacred rituals. All ‘Zenned’ out from that spiritual tour, you’ll be ready to hit the beaches then! Although it’s suggested to skip the crowds at Kuta and Seminyak, and head directly southwards to the serene Bukit Peninsula. 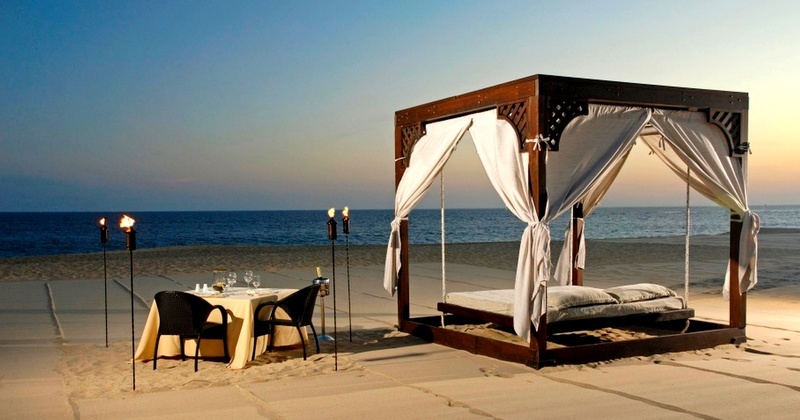 Have a romantic beachside dinner or lunch and just spend some time being lost in the beauty of nature with your beloved! Coral reefs that are teamed with the galaxies of tropical fish and exotic sea life encircle the serene Islands of Tahiti! These warm and crystal-clear waters are perfect for snorkeling and diving, and even beginners can get in on the fun - a lot of PADI schools offer first-time divers intro and five-day certification courses too! That means you can go swimming with those graceful sea turtles, baby moray eels, shy octopuses, candy-colored fish and even the harmless sharks. You can also snorkel offshore at many resorts, or get on a charter boat for guided dives to the best scuba-diving spots, like - Tahiti’s Catalina seaplane wreck or Bora Bora’s Manta Ballroom site. Rated among the sexiest cities in the country - this is a place where you can let your hair down, show some skin on the sands of South Beach — Government Cut! Also, things heat up more when the sun goes down. So, head to Delano Hotel’s Florida Room, a celeb frequented place including Lenny Kravitz, with the intimate lounge. So, what are you waiting for, pack your bathing suit, some uber cool sunnies, a sunscreen and head off to your beach honeymoon destination!